A main feature of the VE experience is “Assuming the Role” which means students interview for departments, such as Finance and Marketing, and roles, such as CEO, VP, and Associate. 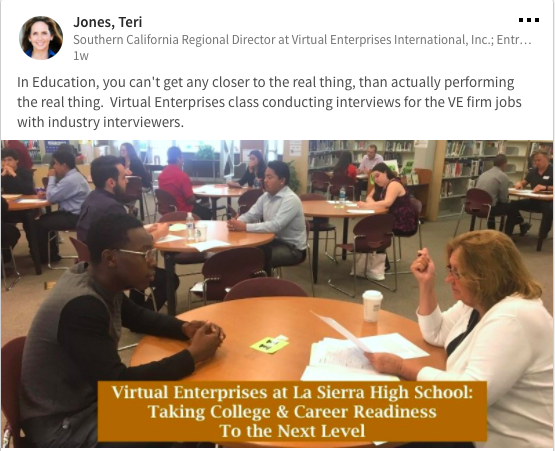 Below are some clips from VE’s social media world to show you what “Sep-team-ber” 2017 looks like as students enter their new professional roles and new company teams form in VE schools around the U.S.
VE-JV students dressed for success – “As part of my VE-JV program at Ramblewood Middle School, I have decided to implement professional dress days. Twice a month, my students must dress in business casual attire (although I still let them wear sneakers). We had a mini-lesson on what professional dress and business casual looks like for males and females. I also showed YouTube videos to show the boys how to tie their own ties…I love teaching this class. I’m so glad that I have been given this opportunity.” – Janice Kohler, 7th & 8th VE-JV facilitator, Ramblewood Middle School, Coral Springs, FL. We love seeing the school year take shape via photos of interviews, employees of the month, and VE businesses announcing their launch ? A bittersweet Website Wednesday since this is @abrilpenanyc's last Website Wednesday in office for the next few months. She will be traveling to Germany for an internship but will stay involved to help VE students with website tips, tricks, and insights. As we enter October, these newly-formed teams of student business professionals will be starting to make their dreams work by forming their businesses, pitching and planning their businesses, and practicing and growing their career readiness competencies.